2018 has seen Stop the Wall involved deeply in the struggle against Israel’s relentless efforts to reduce the Palestinian people into Bantustans, dispossessed, displaced and enclosed by walls and checkpoints. Against all odds, we have achieved a number of victories and given hope and support in the crucial moments to our people in struggle. 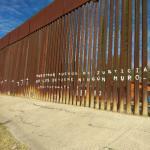 Stop the Wall is now releasing an inspiring summary of our struggles and achievements throughout 2018. Reinforcing Steadfastness is the main strategy to resist Israeli plans of expulsion and dispossession. On Sunday 3rd of March 2019, the judge of the Israeli enforcement authority, rejected the request submitted by the advocates of the Sabagh families to freeze and cancel the eviction order of the five Sabagh families, which was issued on the 8th of January. 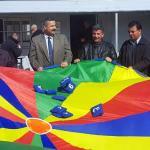 The 32 persons that constitute the five families are again under immediate threat of ethnic cleansing. 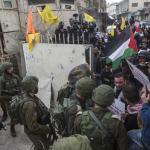 On Friday, February 22, Palestinians organized a mass protest to remember the 25th anniversary of the Massacre of the Ibrahimi Mosque and to protest the ongoing segregation, repression and dispossession of the Palestinian population in Hebron at the hands of the Israeli military and the illegal settlers in the city. Beginning of the year, Israel's minister for 'strategic affairs' had called for the treatment Palestinian prisoners are suffering in Israeli jails to be even worsened. 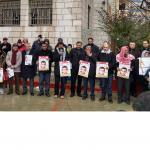 As raids inside the prisons are increasing, inmates are injured or even dying, Stop the Wall joins the Palestinian Higher Committee for Prisoners Affairs for regular protests in support of the over 5000 Palestinians in Israeli prisons. Together with the children of the local school that Israel wants to demolish, Palestinian grassroots movements, including Stop the Wall, and the Cultural Center of Beit Anan, held on Tuesday February 5 an act of defiance and steadfastness. 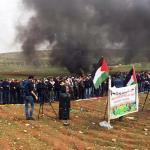 This Friday the village of al Mughayyir stood up together with grassroots movements and activists to fight back against deadly settler violence. 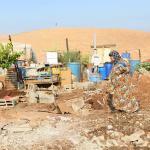 Last Saturday settlers murdered 38-years old Hamdi Saadeh Naasan and injured many more when they invaded the village. 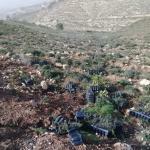 On Thursday 24, the Palestinian Farmers Union and the Stop the Wall Campaign planted one thousand olive trees in Kardala, in the northern Jordan Valley. The aim of the tree planting initiative was to re-claim the land of the people of Kardala, which has been classified as a military zone. Palestinian grassroots movements organized the first bloackade of the newly opened apartheid road, east of Jerusalem. On January 23, activists blockaded the entrance gates to the 5km stretch of road, walled-off in the middle to segregate Palestinians. This year started with continuous, popular protests across the West Bank and with actions of solidarity between the people to strengthen the steadfastness of those in the frontlines of the Israeli attacks. As Israel attempts to push forward its policies of expulsion and apartheid in the occupied West Bank, resistance continues and grows from community to community. 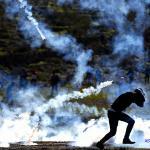 Israeli occupation forces have started 2019 with intense attacks across the West Bank, including military invasions, destructions of the fields of Palestinian farmers, destructions of homes and heavy attempts to confiscate more and more land. The aim is to accelerate the final steps in the Israeli plan of ghettoization that is to turn their apartheid regime in a permanent fixture on Palestinian land. 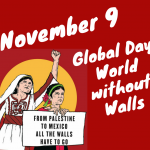 Let’s make 2019 a crucial year for our collective struggle not only against Israel’s apartheid Wall but for a #WorldwithoutWalls! 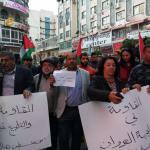 People in Ramallah have taken to the streets in protest over Israel's brutal military escalation against the Gaza Strip that has killed already 15 Palestinians, injured scores and wrecked havock over the already besieged Strip. STEP UP CAMPAIGNING FOR A #MILITARYEMBARGO NOW! Join online InterAction for a #WorldwithoutWalls! Please join us on November 9! Here are 3 InterActions to build momentum for a #WorldwithoutWalls on the Global Day of InterAction. 10 days to the Second Global Day of InterAction for a #WorldwithoutWalls! 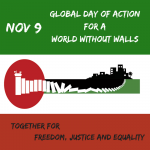 As the countdown starts and movements and organizations across the world are preparing to join in, Stop the Wall releases a first list of planned activities. It's an inspiring coming together of diverse actions united by the determination to build effective solidarity and joint struggles to challenge the walls that oppress, exploit, exclude, discriminate and kill. 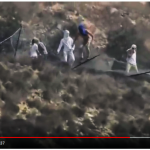 Last Saturday, during an attempt to protect the village of Burin from settler attacks and to support the farmers in the olive harvest season, some 50 settlers backed by the military have attacked activists and villagers. Sunday October 21, the Israeli 'security' cabinet ratified the decision on a temporary freeze of the demolition of the Palestinian Bedouin community Khan al Ahmar, even if accompanied by further threats. The freeze is result of the popular steadfastness on the ground and ever growing global pressure. Israel's announcement has shown the impact we can have, but this can only be the start. This morning bulldozers arrived again at Khan al Ahmar to pave the way to more roads to prepare for the demolition of the community. One person has been arrested, five injured. As the battle is continuing to stop the demolition of Khan al Ahmar, destructions all over the West Bank are silently but relentlessly continuing. On Saturday 200 youth activists from all across the West Bank met in the Second Conference of the Palestine Youth Forum to build together strategies and tools for struggle. Entitled “Youth for Change” the conference aimed to define the vision and objectives of the Palestine Youth Forum and work plan for the coming two years. 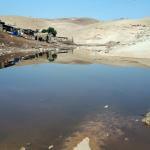 The river and lake that have since yesterday appeared in Khan al Ahmar are stinking sewage water from the illegal settlements. 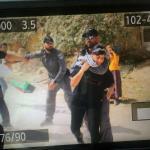 See photos of the environmental crime and the gross human rights violation and harrassment here. Since yesterday night, over 500 people are gathered at the village of Khan al Ahmar to support the community in the moment the Israeli deadline for demolition expired. 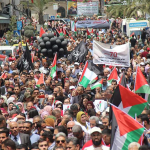 Khan al Ahmar and the Palestinian people in solidarity are counting on international support. 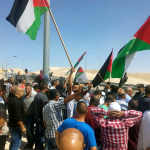 Over 200 people gathered at Khan al Ahmar to let Israeli military know that collective struggle will defend the community from any demolitions Israel is planning. Occupation forces closed the access roads to Khan al Ahmar, nevertheless many went marching on foot to join the protest. 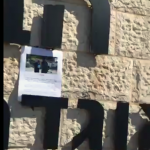 Never losing their sense of irony, even during daily struggle, Palestinian grassroots activists yesterday responded to Israel's leaflets ordering the people of Khan al Ahmar to destroy their own homes by distributing their own leaflets to the soldiers of Beit El military settlement. 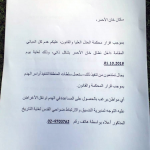 Yesterday night, Israeli occupation forces have distributed flyers to the people of Khan al Ahmar demanding they should destroy themselves all the homes and building of the community until latest October 1. Israel’s military even offers ‘helpline’ for the people in Khan al Ahmar. 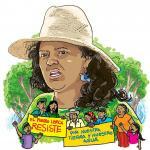 We are following closely the trial of the murder of Berta Cáceres, leader of the Civil Council of Popular and Indigenous Organizations in Honduras (COPINH), being held from September 10-28. A death squad assassinated her on March 2, 2016 in her home and wounded Gustavo Castro, member of Friends of the Earth Mexico.